You are here: Home / Holidays / 4th of july / Happy 4th of July! 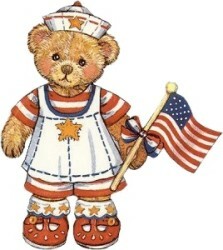 I would like to wish all of my lovely readers a very Happy 4th of July! I would like to thank of all our veterans that proudly served our country – active, reserved and retired! Freedom isn’t free, and you’re out there on the frontlines protecting that precious freedom we often take for granted. Hope you all have a great time with your 4th of July parties! Please remember why we’re celebrating while you’re partying!